The software development process has evolved from vendors owning, controlling, and selling proprietary software into a collaborative, open source model. The process of producing energy is going through a similar evolution. Consumers have become producers, generating and sharing sustainable solar, wind, and hydro energy, and open source software is part of that energy production evolution. In this article, I will introduce PowerMatcherSuite, a Flexiblepower Alliance Network project licensed under the Apache License, version 2.0. The suite is comprised of two disruptive open source technologies: the PowerMatcher and the Flexible Power Application Infrastructure (FPAI). Both technologies are complementary, but can also function on their own. The PowerMatcher is a smart grid coordination mechanism. FPAI is an operating system that enables appliances, the smart grid, and smart services to communicate with each other. The outdated energy business model is similar to the proprietary software business model. In the same way big companies control source code and sell proprietary software, conventional power plants produce, control, and sell energy. Open source software is collaborative, with control of the software in hands of the end users. The new energy model is based on sustainable power sources and is increasingly decentralized. People place solar panels on their own roofs, for example. In both the energy and the software case, end users have more control. This new model led to a shift of power and power flow. Power is not only flowing from power plants to end users, but also from end users (who are also energy producers) to other end users. Individuals and small collectives are starting to produce energy outside the control of the energy production and distribution companies. New challenges include weather-dependent power production and balancing energy production and consumption. Smart grids can be part of the solution. The definition of the smart grid varies, but the bottom line is an information exchange layer on top of the power grid. Smart meters, automation, and demand/supply systems can be part of smart grid. Demand and supply systems match the power consumption with the power production to integrate renewable energy without additional storage. Examples of flexibility in consumption can be found in charging electrical vehicles and hot/cold processes. To solve this problem the open source way, the Flexible Power Alliance Network decided to release the PowerMatcher Suite free and open source. PowerMatcher is an agent-based technology to leverage the power consumption and production in a decentralized manner giving the users full control. Besides the demand/supply function, the technology can also help to prevent an overcurrent due to congestion by using the flexibility in power production and consumption devices. This could be relevant for power distribution companies. The PowerMatcher core application provides the market mechanism for the determination of the market equilibrium, while the devices work as actors for demand and/or supply. 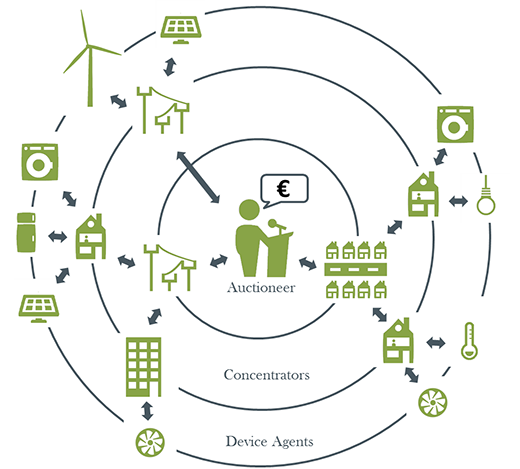 Each device, whether it's a washing machine, windmill, or industrial turbine, can express its willingness to consume or produce energy in the form of a bid (a demand or supply relationship). All bids come together in the market mechanism of the PowerMatcher and result in an equilibrium price. More information can be found on the PowerMatcherSuite website. The open source implementation is written in JAVA OSGi. The community consists of Flexible Power Alliance Network members (Accenture, Alliander, CGI, DHPA, ECN, Stedin, Technolution and TNO). There is a small team doing active development in the community (employed by their FAN member organization). The technology is used in smart grid experiments. PowerMatcher is currently running in about 1,000 households and industry sites in the Netherlands, Germany, and Denmark. The PowerMatcherSuite technology is especially interesting to the early adopter/hacker/DIY maker crowd. With the suite they can hack their own house, turning it into a microgrid or even going off grid. You can connect your washing machine to your solar panels and battery and become fully self-sustaining. The PowermatcherSuite can also be used as building block for a business by running your own virtual power plant. With the new release, PowerMatcher 2.0. The PowerMatcher code is redesigned/rewritten to lower all barriers for participating in the community. We are looking for contributors that want to participate in a more sustainable ecosystem. Any contributions are welcomed: from writing FPAI device drivers to feature additions and bug fixes. For the next phase in development, we are especially looking for more connectivity to devices (device drivers). In terms of improving the core framework, we are looking at security features next. This is a top priority when preparing for large scale rollouts. File a Github issue if you need help or want to contribute. Great article Sander! Always great to see this kind of technology, and open source, being applied in your own country. It is so great to see activity in this area, I had been meaning to do some research on what was available. This is an exciting time when power production can be done in a more distributed fashion using renewable power sources, and seeing open source software to help make this happen is extremely encouraging! Really enjoyed reading this article. I love hearing stories about open source helping in unexpected places.